while getting rid of copper, mercury and cadmium contaminations that could trigger disease gradually. The Brita Everyday Pitcher is BPA-free and also features a sticker filter indicator which notifies you when it is time to replace your filter. Change your filter every 40 gallons or about every 2 months. The, 10 mug capability makes this bottle perfect for the cooking area and also office refrigerators. By consuming filtered water, you are minimizing the number of plastic bottles which end up in our landfills and oceans. One Brita water filter made use of equals 300 plastic containers saved. Beginning alcohol consumption healthier, great-tasting water with Brita today. 3171 reviews with about a 73% Amazon Verified Purchase. Therefore the ratings are verified and not cooked. The sheer number of review tells this Britta is a very popular brand. So we see mostly happy people with a few problems. We also note with surprise the Amazon Sales Ranking. 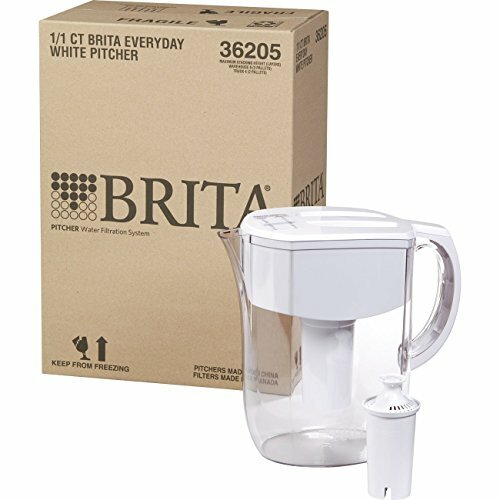 Brita 10 Cup Everyday Water Filter Pitcher sales ranking is #1 in Home & Kitchen > Kitchen & Dining > Water Coolers & Filters > Pitcher Water Filters. Yup #1 sales Ranking in a huge category. 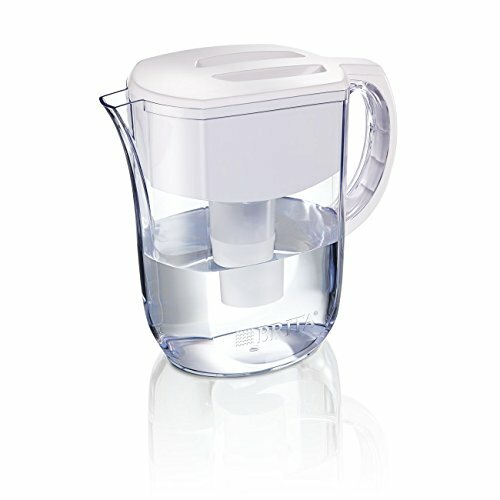 BeHealthyBeMore.com is about to offend at least 2664 because we see a lot of problems with Brita pitcher systems. But before we do that, we are posting this review only to give Brita user a chance to look at other options. It is not that we are all down on Brita, but it may not be the best option for your family. First, they proudly show the NSF Certification looking like standard 42 and 53. Implying they meet Standard 53, which they do not. Well, 42 maybe but 53, no. Their claim they meet standard 53 performance standard for the three contaminants they list: Copper, Cadmium, and Mercury. Taking out copper, cadmium, and mercury is a good thing, but what is implied is so much more. Indeed, on the Brita website was a testimonial using the terms “clean and pure” which is not a claim by Brita but an association you make in your mind. Note, however, this is an improvement over the older Brita Filters, and good for Brita for making the Brita 10 Cup Everyday Water Filter Pitcher a healthier filter. In contrast, check out the review and rating of the Nikken PiMag Waterfall. That rating will show you everything the unit is certified to the full standard of 42, 53, and 372 Low Lead affect: Aesthetic Chlorine, Chloramine (Monochloramine) (Reduced by 99.4%), Mercury pH 6.5, Mercury pH 8.5, VOC’s, Alachlor, Atrazine, Benzene, Carbofuran, Carbon Tetrachloride, Chlorobenzene, Chloropicrin, 2,4-D, Dibromochloropropane (DBCP), 0-dichlorobenzene, P-dichlorobenzene, 2-dichloropropane, cis-1,3-dichloropropylene, Dinoseb, Endrin, Ethylbenzene, Ethylene dibromide (EDB), Haloacetronitriles: (HAN), Bromochloroacetonitrile, Dibromacetonitrile, Dichloroacetonitrile, Trichloroacetonitrile, Haloketones (HK), 1,1-dichloro-2-propanone, 1,1,1-trichloro-2propanone, Heptachlor, Heptachlor ePoxide, Hexachlorobutadiene, Lindane, Methoxychlor, Pentachlorophenol, Simazine, Styrene, 1,1,2,2-Tetrachloroethane, Tetrachloroethylene, Toluene, 2,4,5-TP (Silvex), Tribromoacetic acid, 1,2,4-Trichlorebenzene, 1,1,1-trichloroethane, 1,1,2-Trichloroethane, Trichloroethylene, Trihalomethanes (includes): Chloroform (surrogate chemical), Bromoform, Bromodichloromethane and Chlorodibromomethane, ZXylenes. 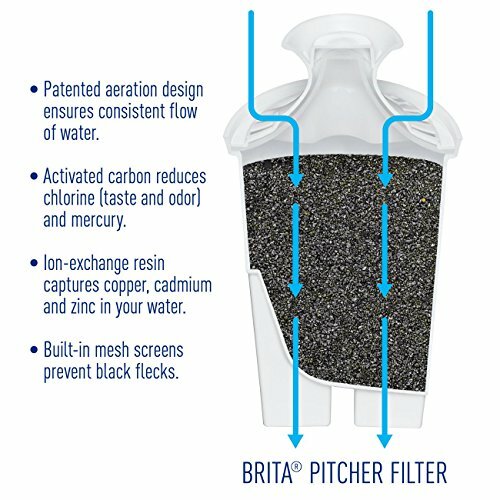 Brita filter was rated for 40 gallons for $8.00 (at the writing of this review). That same 273 gallons filter would cost $56 and need 7 changes, or about $370 a year [More that the cost of the Nikken PiMag Waterfall. That does not save time or money. In contrst, the Nikken filter linked above is about $66 yearly. Water is important to your health and the health of your loved ones. We take water purification very seriously. We would sure hate to see a company imply their products are better for you than they really are. Then in the small print lay out what is really going on. We suspect many Brita fans believe “tastes better = healthy”. If you want, go to the website and notice the message of the site. Then go read the reviews and make up your own mind if Brita is a company worthy of your financial support. There are other options. Our Rating is based on the idea bad water tasting better only encourages people to drink more bad water. Brita brings very marginal health benefits, improves the taste with standard 42, leaving many health concerns still in the water. If you purchase the Brita 10 Cup Everyday Water Filter Pitcher knowing that is not as healthy as they want you to believe, then it’s not bad. Filter cost is high and there are other water filters that filter out a whole lot more, then we rate it a (3.5 / 5). Why? 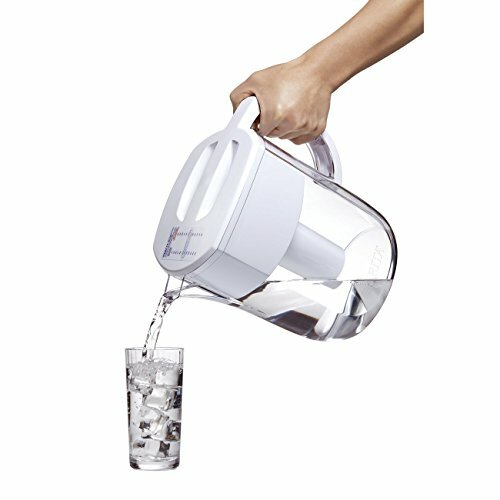 This is a BeHealthyBeMore.com review, so we say what is the use of Brita 10 Cup Everyday Water Filter Pitcher?